660 nm "RuVY Touch*" - the safest freckle treatment. RuVY Touch is a safety-proven new pigment removal treatment using a unique wavelength. 660 nm, that significiantly reduces the possibility of having post-treatment side effects such as PIH. Suitable for epidermal pigmented lesions. 595 nm "Gold Toning" - One-stop solution to erythema and acne. Gold Toning using the 595 nm wavelength lightens post-acne redness and also helps in the reduction of inflammatory acne by virtue o its characteristics through which vasculature in an abnormal status is returned to its normal state throught photobiomodulatory effects. Suitable for post-acne erythemia, acne (especially for vascular factor), melasma (especially for vascular factor), facial flushing. Laser Toning - perfect choice for melasma treatment. 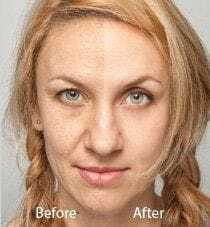 Laser Toning removes or lightens the appearance of melasma as melanin and melanosomes in the skin are selectrively destroyed by the laser energy. The clinical benefit has been proven over recent years in all differenty types of skin, and it is now even more effective with the hnew treatment mode of Spectra XT using its double-pulse technology. 1064 nm 45J "Revital Treatment" - Ultimate skin rejuvenation solution to revitalize your skin. If you are one of those people who have suffered from such none-responsive large pores and wrinkles, then Revital treatment is the no-downtime skin rejuvenation solution you can rely on. Suitable for acne especially seborrhea, pores, skin rejuventation. Jennifer Aniston, Angelina Jolie and Kim Kardashian are always snapped with perfect skin on the red carpet and their favourite facial treatment could have something to do with it. Hollywood Peel Carbon Spectra Laser Peel is a leading anti-ageing treatment in LA. The Hollywood Peel takes 30 minutes the procedure is comfortable.